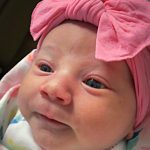 Emerson Faye Trejo, born July 25, 2018, age 12 days, died surrounded by family and friends at Cook Children’s Hospital in Fort Worth, TX on August 6, 2018. Like a shooting star, her flame burned fast but furious, gripping the hearts and gracing the souls of her parents, brothers, grandparents, and countless other family and friends. She was mama’s baby and daddy’s girl. Visitation: 6 to 8:00 P.M. Thursday, August 9, 2018 at Biggers Funeral Home. Service: Funeral services will be held at 10:00 A.M. Friday, August 10, 2018 at Biggers Funeral Home. Burial: A procession and gravesite service following at Greenwood Memorial Park, 3100 White Settlement Road, Fort Worth, TX. Memorials: To help offset the young couple’s unexpected medical and funeral expenses, the family requests donations from those inclined to be made to the Emerson Trejo GoFundMe page at www.gofundme.com/9t6cb5-funeral-expenses. Emerson is the daughter of Presley and Elias Trejo of Fort Worth. She was the perfect answer to their dreams and prayers, and they waited for her birth with eager, joyful expectation. When she arrived, she looked upon an elbow-to-elbow room full of family who adored her already. She was alert and seemed unafraid of her new surroundings. During her brief visit on earth, Emerson loved taking baths, soothing with her pacifier, and being held by her brothers. Kisses made her smile. Her gorgeous hair graced an angelic face and topped her perfectly symmetrical round head. She found particular delight nestling skin-to-skin with daddy and being swaddled by mommy. Though her spark was brief, her impact was great. She is always remembered and forever loved. Survivors: Emerson is survived by her parents, Elias and Presley; brothers, Carson and Dawson Trejo; grandparents, Shauna and Jeff Jones, Chris and Kristi Smith, and Lupe and Victoria Trejo; aunts, Riley and Landry Smith, Harley Glenn, Lisette Trejo; uncles, Timothy and Estefan Trejo and Ethan Glenn; great-grandparents, Deborah and Don Horn, Patty Smith, Mike and Robin Smith, Pat and Lisa Meyer, Lino and Marie Garay, Maria Martinez; great-great-grandmothers, Lucy Aguilera and Nancy Cearley; cousins, Nolan Washington, Roan Trejo; and numerous extended aunts, uncles, and cousins. Rest easy beautiful angel baby. Too precious for this world. My deepest sympathy to the parents and family for the loss of your precious baby girl, Emerson, and may you be comforted by Almighty God (Psalm 83:18) through His written word, the Bible about a future time when He'll do away with everything that causes us pain, suffering and sorrow by undoing all effects of Adamic sin from the human race and the earth--1Corinthians 15:21, 22--Jeremiah 29:11, Acts 24:15, Isaiah 33:24, Isaiah 25:8. Your family doesn’t know me but I came across your baby girl’s obituary. I wanted to let you know that my heart goes out to your family. Please find comfort in Gods word the Bible and His promise found at Revelations 21:3,4. We all have the hope of seeing our love ones again. Fly with angels our lovely angel . She was the light that will never die. Fly with angels our lovely angel. May the brightest candle always shine for you, Emmy Faye!